Actually, the "problem" described here is not politics. The problem is "The Inconvenient Second Amendment". 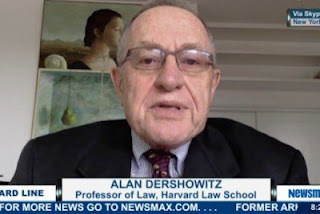 Invoking the text of the Second Amendment, Dershowitz suggested that guns should be more heavily restricted. “Guns have to be well regulated and they are not well regulated in this country. We’re going to have these kinds of massacres over and over and over again until we change the gun culture and the National Rifle Association is part of the problem, not part of the solution,” he said. THAT is the real "problem" with the Second Amendment; too many Americans are willing to throw one of our Constitutional Rights "under the bus" because it's inconvenient. Derschowitz is entirely too eager to throw out the baby with the bath-water. His "solution" is to penalize the law abiding. But so many liberals would like to write the inconvenient Second Amendment out of the Bill of Rights, that they see no problem with treating it as simply a privilege that the government can take away at will. Let us be clear about this: the Second Amendment protects the right of any sane, law-abiding mature citizen of the United States to keep and bear arms ... including firearms. It is not a right which is PROTECTED by the Constitution; it is a right which is RECOGNIZED in the Constitution. Their logic if flawed. Violence is not contagious, except that societal aberrations in our culture allow people to violate the laws which protect the innocent. Why should we accept laws which penalize the law-abiding? We already have laws forbidding firearms possession by criminals; these laws aren't achieving the desired result. The argument is not that we should obviate the laws because they are ineffective; we have laws against speeding, too, but people still break these laws ... and the violators pay the price when they're caught. We cannot make a law which will prevent criminals, terrorists, madmen from acquiring weapons; the only laws we can create are whose which will restrict "The Good Guys". Sixty rounds in your Glock? (a) TACCOM 9mm Extension for the 33 round 9mm Glock magazine. We’ve come up with an extension and spring that will feed your PCC efficiently. Made from 6061 aluminum, it will take the abuse of competition and keep on running. The internals of the extension are smooth to allow for both the follower and the rounds to flow effortlessly thru for thousands of cycles. Easy to assemble too!! Note: Keep in mind that the end user must chamfer the inside of their magazine as well as their follower so that you get a smooth transition when the follower re-enters the magazine. An idea whose time has not come? The curmudgeon in me refers back to Viet Nam where we couldn't get the 30-round "banana" magazines for M16's (apparently those of us 'in the field' had second or third call on equipment, including magazines, boots and replacement arms ... right after the Officers and the REMFs stole the good stuff) and in fact we used the straight 20-round magazines but downloaded them to 18 rounds, because the springs lost their resiliency when kept fully loaded for days at a time. So I'm historically dubious about claims exceeding my experiences. These magazines are obviously not intended for the kind of abuse and poor maintenance suffered during a combat tour. My experience competing in IPSC matches / "Open Division" was that the 25-round magazines had to be treated with kid gloves. We removed the springs (or at least the end caps) from the magazines so the springs were not under any tension between usages ... which is to say, right up to Match Day. That kept their 'strength' up so there were more or less reliable, but we still tended to down-load the magazines by a round or two. We’ve come up with an extension and spring that will feed your PCC efficiently. By that I presume that advances in metallurgy have resulted in springs which WILL perform reliably under the most grueling of conditions. On the other hand, I recall a couple of very smart fellows who once said: "640 kilobytes of memory should be enough for anyone", so I suppose it's possible that I've misjudged modern technology. Not for everyday carry, but this ad hoc technique allows ready access to a defensive weapon in "unusual circumstances". During the Election Season last year, I admitted online that I was conflicted about my presidential vote. Should I give my vote to "The Donald", who knows how to make money but is relatively clueless about how to be a president? Or should I give my vote to "The Hillary Beast", who knows how to run a country but would run it in a direction I could not accept? Ultimately, I voted for "Not Hillary". And now I ... and the rest of America who faced the same difficult choice ... are paying the price. I'm disappointed in President Trump, and I'm angry when people criticize him for his (so far) poor performance as a president. I agree, though, that this is one of the most inept presidents we've been saddled with since ... oh, I don't know ... the Peanut Farmer? Considering the alternative, though, I continue to believe that Trumps failures to live up to his promises is the less painful outcome, compared with a potential Hillary-beast presidency. Trump fails to live up to his promise; if Hillary had lived up to HER promise, it would be an even more grim America. In self-help books I have repeatedly seen a two-by-two matrix used to evaluate individuals. The four elements in the matrix were labeled: Brilliant & Lazy, Brilliant & Energetic, Dumb & Lazy, and Dumb & Energetic. Curiously, the brilliant and lazy were extolled above all others. Any officer who is clever and industrious is destined to positions of great responsibility, while an officer who is clever but lazy will do no great harm because he won't seek a position of responsibility. But an officer who is stupid but Industrious will have the will to make changes, but lack the wit to avoid endangering his men. Trump, I believe, falls under the "Smart and Industrious". He chose to make money, and used his fiscal position to achieve positions of great power. Hillary falls under "Stupid and Industrious". She chose to make her mark in the political scene, which gave her a similar position of great power. But as much as people tend to consider her 'smart' ... she took the easy route to power; she chose to seek popularity rather than industriousness. She did not create wealth; it was donated to her. 2: or you can win it with the cult of your personality, which Hillary almost did. But the difference is ... the Thinking Voters have to TRUST the candidate. Nobody trusted Trump, either, but Hillary's history of lies and deceits worked against her so strongly that she could not escape her own past actions. Ultimately, Donald Trump is President of the United States not because he was trusted, but because he was Not Hillary! Personally, I would have voted for The Man In The Moon before I voted for Hillary, because she had no political or moral compass, and her past actions proved that she was not the right person to lead our country in the coming years. Does Trump have the moral values to deserve this high office? I don't know. But I do know who does NOT have sufficient moral values to represent my birth nation; and she lost.